"City Mouse with Bartlett Hall in background"
An image of the sculpture City Mouse on the campus of the University of Northern Iowa in Cedar Falls, Iowa. The sculpture by Andrew Arvanetes was installed in 2002 and is an Iowa Art in State Buildings Project purchase. The medium is painted steel. 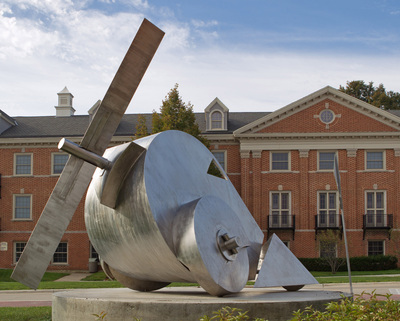 "City Mouse with Bartlett Hall in background" (2019). Art on Campus Photographs. 92.